In 2001, the Drug-Free Communities Act reauthorization provided for the development of a National Coalition Institute. The mission of the Institute is to increase the knowledge, capacity, and accountability of community anti-drug coalitions throughout the United States and territories. The Institute is CADCA’s primary vehicle for delivering training, technical assistance, evaluation, research, translation, and capacity building products and services to support coalition-specific substance abuse prevention and policy development. The team is always working on the next round of groundbreaking offerings to support CADCA’s coalition network. Our global focus along with the changing national landscape as it pertains to drug legalization requires CADCA, including the Institute, to innovate and pave the way for future coalition professionals and prevention practitioners. The Institute is comprised of two departments. The Training, Coalition Development TA & Outreach Department (TTAO), provides intensive training experiences and brief customized support to immerse coalitions in best practices and essential processes to achieve positive community-level outcomes. The Evaluation & Research Department (E&R), advances evaluation and research techniques and methodologies to improve coalition effectiveness. 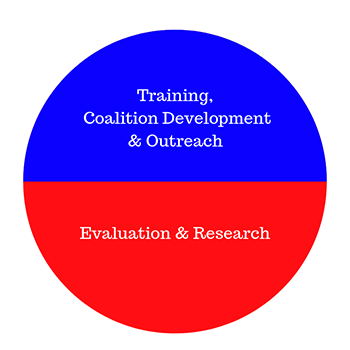 Evaluation and Research builds the local data collection and evaluation capacity of coalitions, evaluates and conducts research on the Institute’s training and coalition development, and works to use research to inform coalition work. Want more information about The Institute? For technical assistance, contact Jackie Rhodes, Technical Assistance Manager at 1-800-54-CADCA, ext. 240 or training@cadca.org. For more information or to contact the Institute leadership, please email institute@cadca.org or call 1-800-54-CADCA, ext 240.